Product #17558 | SKU MOUSE | 0.0 (no ratings yet) Thanks for your rating! 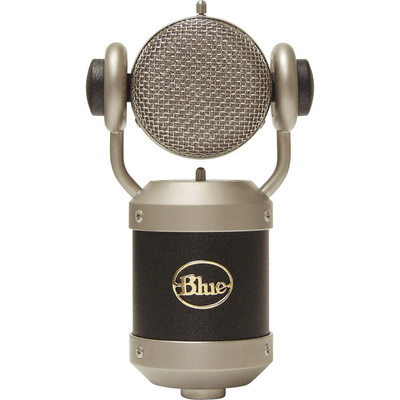 The Mouse Microphone from Blue features a cardioid pattern studio condenser design and can be used with both vocal and general instrument recording. The cardioid pattern effectively minimises off-axis sound, reducing noise caused by room ambiance, monitors, and other instruments. The microphone's capsule employs a single-membrane configuration and offers a 6-micron thick mylar film sputtered with a mixture of gold and aluminium and tensioned to hand-built brass backplates. This capsule provides transparent sonic quality while handling high sound pressure levels, making it suitable for recording in a wide range of applications, including drums, percussion, vocals, brass, guitar, and stringed instruments. The Mouse's rotating capsule and compact design allow for high sonic quality and mic placement in difficult spaces. The package includes a wood storage box and a shockmount. The cardioid polar pattern minimises off-axis signals caused by room ambiance, monitors, and mechanical and instrument noise. The Mouse features internal shock mounting in the grill and at the rotating axis of the grill. It also includes an external shock mount for additional support and isolation. There is a pressure-gradient diaphragm with a 6-micron thick mylar film sputtered in gold and aluminium and tensioned on hand-built brass backplates. The Mouse offers a rotating capsule, suitable for miking in difficult spaces and for achieving optimum recording quality.